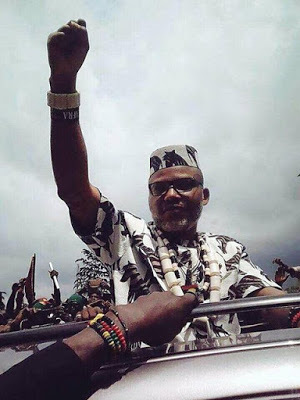 The leader of Indigenous People of Biafra, IPOB, Nnamdi Kanu, has declared that it was better he died fighting for the actualization of Biafra. Kanu also alleged that the government was using the media to spread false information about him and his agitation for Biafra. In an interview with SarahaReporters, Kanu revealed that the people in power know that he was the right person to lead the people, thereby employing all means to make him lose the support of his people. Nnamdi reiterated that nothing can make them reverse on their decision from breaking away from Nigeria. “There is absolutely nothing anybody can do. We have crossed the point of no return and there is nothing anybody can do, if I am alive or dead wherever I may be, Biafra will come. If I die, it will be better because it will even make it come quicker. “The media has an interest in maintaining one Nigeria with those that loot, steal and cheat in the political landscape. The more Nigeria continues, the more this criminal and rogues get fatter. “All those spreading nonsense about Nnamdi Kanu know that Nnamdi Kanu is the only person capable of articulating a policy that can get people out of the mess that we are in. “The government wants us to remain poor, they know what they are saying is false but they continue to say so. “People should be more concerned with the gross abuse of human rights being perpetrated by DSS, Police, and Army. “They should ask questions on Amnesty report, the mass grave in army barracks in Onitsha, bad roads despite the resources in the country and unemployed graduates.